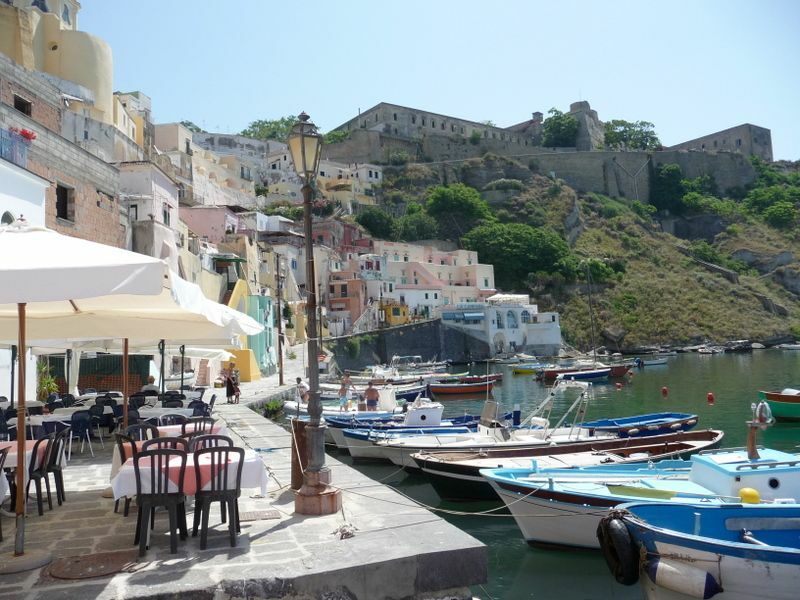 Location for the shooting of “Il Postino” and “The Talented Mr Ripley” and cradle of the delicious crushed ice flavoured with lemon juice, Procida makes a great choice for holidays in a setting where the bright colours of its cube houses in Marina Grande form a precious background. Atop the hill is the 16th century Castello d’Avalos built by the Bourbons, serving as prison until the 80s. For its beautiful views only if they had a recommendation prisoners were taken to it. Boats dock at Marina Grande from where you set off on a voyage of discovery. 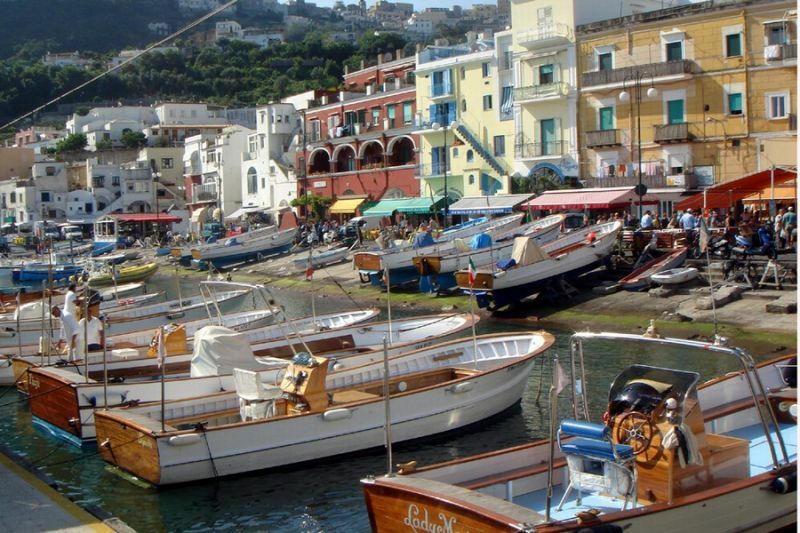 From there on you can make the most of it on foot or by bike for Procida is so small. As you arrive you can head for Graziela travel agency on Via Roma to set up boat tripping and bicycle hiring. The Abbazia di San Michele Arcangelo on Via Terra Murata dates back to the 11th century. Later on it underwent modifications in the 1600s and 1800s. It houses a church , a little museum displaying some pictures and plenty of catacombs. If you stroll to Piazza dei Martiri you will enjoy a view of Marina Corricella’s colourful Arabian-style abodes. Near Via Pizzaco to the south Spiaggia di Chiaia attracts visitors with its sandy beaches reached by a staircase descending to it. Some traditional restaurants are located at Marina di Chiaiolella with yachts awaiting to take its owners away on a voyage around this precious gem of bright colours and Arabian flavour. From the harbour you can set off on a boat trip or even in a galleon around the island. At Ippocampo you can hire a rubber dinghy or a wooden boat. Nearby you can go to the Lido di Procida the bathing beach filled with swimmers basking in the sun. The nearby little island Vivara is at present not available to tourist for its indigenous fauna and archaeological monuments are been preserved. It is unknown when it will be open to public. Procida diving centre on Via Cristoforo Colombo offers diving courses and equipment for rent. To hire a yacht, contact Blue Dream on Via Ottimo. The Procession of the Misteri fills Procida’s streets with bright colours on Good Friday. Men attired in blue tunics and white hoods and girls representing the Madonna, while Jesus and Maria ‘statues and tableaux representing moments of the crucifixion travel the island. Il Vento del Cinema the festival of art-house cinema is celebrated yearly for five days in Procida. It is a wide draw for film lovers. 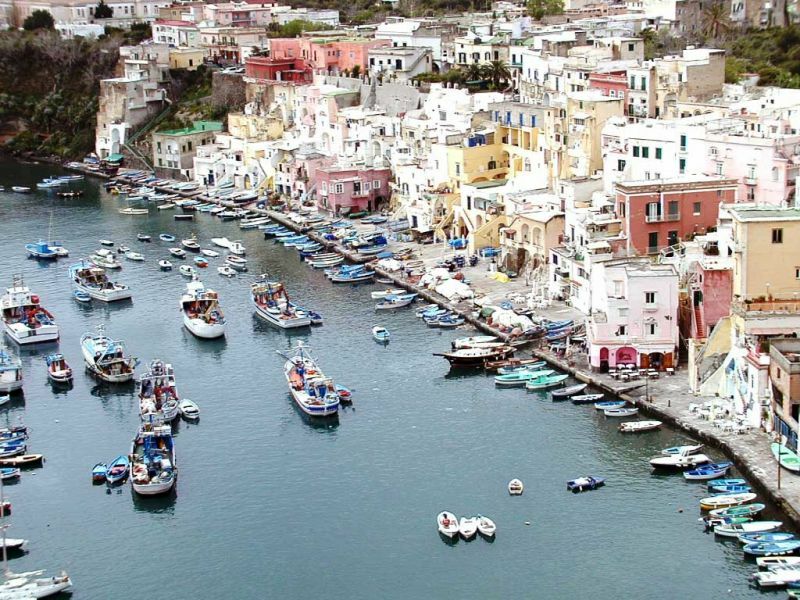 There are not so many places for entertainment in Procida for its core attraction is its tranquillity and not its bustling night. You can head for GM bar for a bit of nightlife with bands playing jazz or some Latin and pop music on Friday. Choose Saturday for commercial house or come on Sunday for commercial/Latin. The passeggiata and people watching develop at Bar Roma on Via Roma. The best purchase you can find in Procida is ceramics, wine and local art. At Enoteca Peccati di Gola (Via Vittorio Emanuele) you will be tempted and surrender to Campanian labels and others coming from different regions.At Luigi Nappa Gallery on Via Roma in Marina Grande jewellery, contemporary paintings and sculpture make a good option for a decorative souvenir of Procida. Sisters sell all souvenirs with Med flavour such as ceramic jugs, coasters, coffee cups or, the best choice to take home, the vintage photos. Whether you choose to eat out on the seafront or at a trattoria inland you will be served fresh food, much of it prepared with home-grown products and game, luckily, at affordable prices. A local speciality is the insalata al limone with a touch of chilli oil. Bar Cavalieri on Via Roma (Marina Grande) fills with customers attracted by its ox tongue, pastry stuffed with custard and shaped like a tongue. On Via Roma, at Marina Grande at the Trattoria Fammivento there is nothing like its crustacean and mollusc soup, its speciality. Pasta with artichoke and calamari and many other combinations of pasta and fish will delight your palate. The setting of trattoria Graziella with bobbing boats and their nets is great for simple food such as sandwiches, burgers, pasta with spicy tomato and chilli sauce and grilled chicken. La Conchiglia on Via Pizzaco is a mesmerizing setting of water of ravishing colours and the Marina Corricella in the distance serving delightful seafood and pasta. Ristorante l’Approdo serves food prepared like mammas do in a setting with views of the boats arriving at Marina Grande. Ristorante Scarabeo on Via Salette offers all homemade dishes prepared with their own rabbits and traditional recipes. Dining under the shelter of lemon groves makes it perfect. BY BUS: some buses depart from Marina Grande to other parts of the island. BY FERRY AND HYDROFOIL: to Ischia (length: 20 minutes). BY OPEN–MICRO TAXIS: these little vehicles are available for 2-3 hours.